Have you felt the urge to burn a candle lately? I have! The weather turns the tiniest bit chilly and I’m busting out every candle I can find! It’s going to look like that scene from The Phantom of the Opera in here soon. A few years ago I discovered how nice soy candles are: they burn really clean and last longer than normal candles. The problem is that they’re also pricier than normal candles. Since they burn so much longer, I do think that the higher price is worth it, but then I discovered that I could easily make my own! This makes my fancy soy candles a very inexpensive treat. Plus, they’ve turned into an amazing gift that I give people for holidays, birthdays, house warming gifts… Everything! Candles are that generic gift that works for all situations, right? But since it’s homemade, it’s no longer generic and becomes quite special. 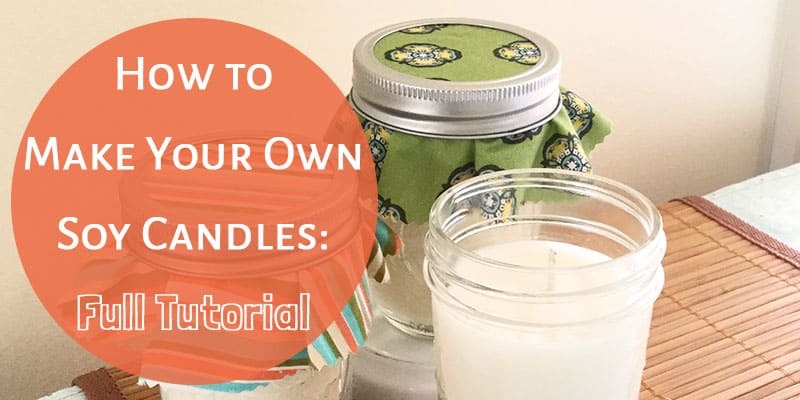 Anyways, these are so darn easy to make and I’m going to show you step by step how to make soy candles so that you can make your own to enjoy yourself or to give away as amazing gifts! Update: I made a video tutorial of how to make soy candles so that you can see what it looks like! 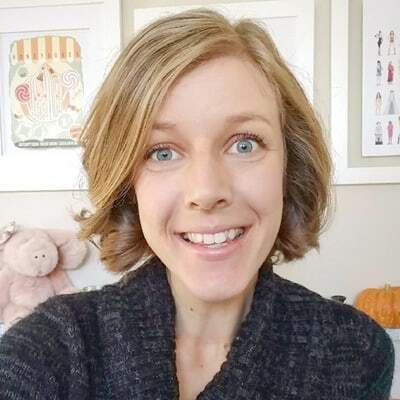 In the video, I walk you through the whole process while I make a batch of candles. I use the microwave method because I think it’s a lot easier the less messy that doing it on the stove. 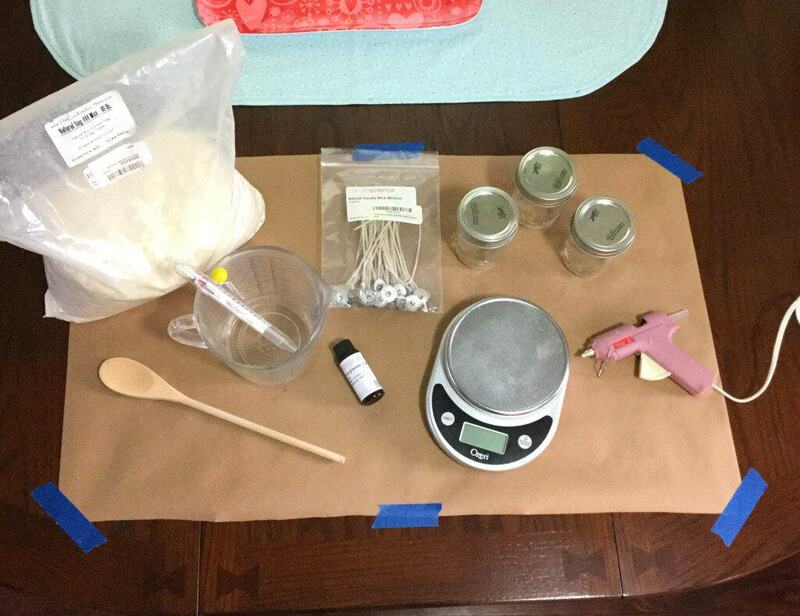 This “recipe” uses one pound of wax and creates 3 – 8oz candles. Cover your table or counter with newspaper to protect it. Squirt some hot glue on the bottom of your wick (the metal part) and quickly stick it to the middle of the bottom of each canning jar. 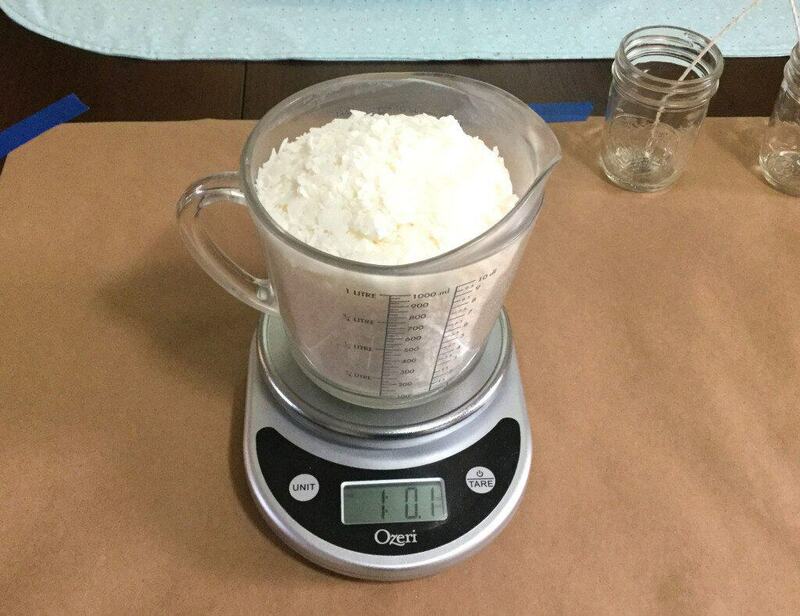 Using your food scale, measure 1lb of wax into your glass measuring cup. It will pretty much fill it up. Microwave the wax in the glass measuring cup for 5 minutes to melt the wax. You want to heat the wax up to 170-180°. Us the candle thermometer to test the temperature of the wax after 5 minutes. If your wax isn’t hot enough after 5 minutes, keep heating it in 30 second intervals to get it to the right temperature. Use an oven mitt to take the measuring cup out of the microwave. It will be hot! 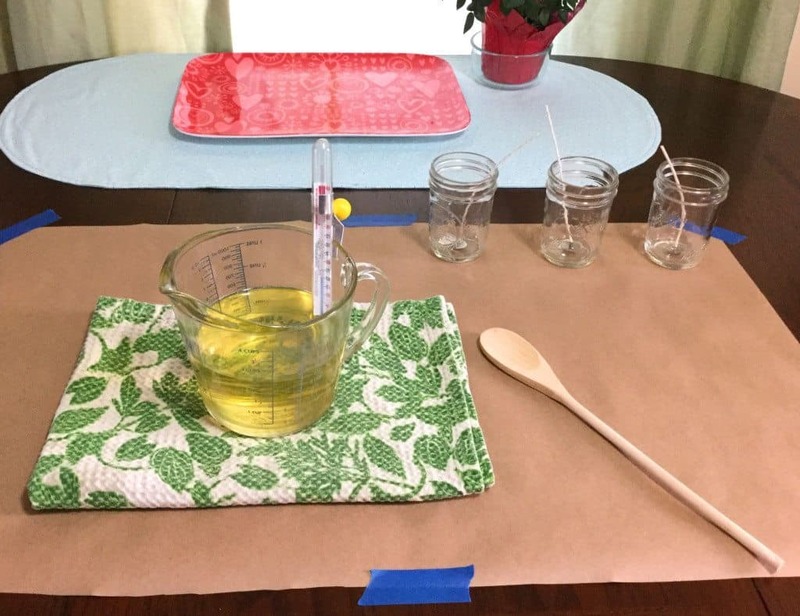 Once you’ve reached 170-180°, set the measuring cup on the table and gently stir the wax. You need the wax to cool down to about 140° so that you can add your fragrance oil. This part gets a bit boring. Just keep stirring constantly and check the temperature again every few minutes. After each time I check the temperature, I like to wipe the thermometer off with a paper towel so that the wax doesn’t cool on it. When your wax cools to 140°, pour in your ounce of fragrance and keep stirring. It won’t look any different since there is no color in the fragrance. 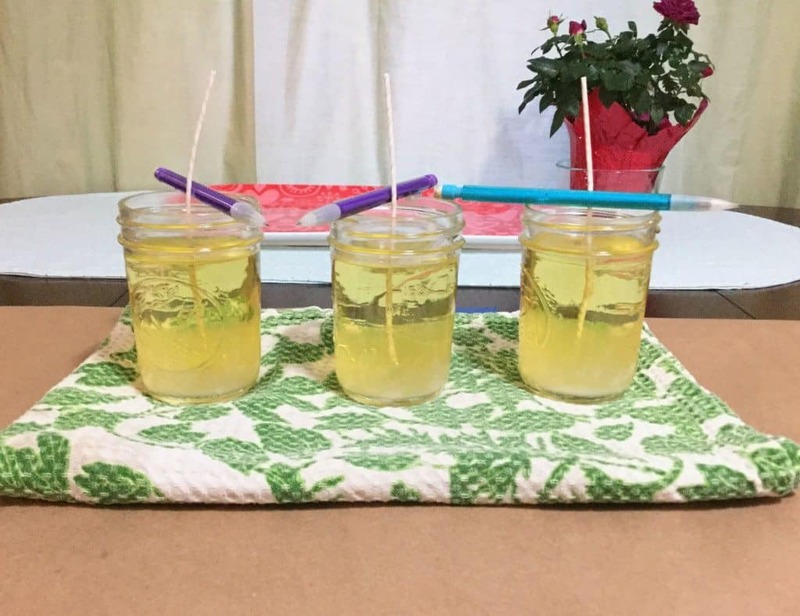 You want to pour your candles at about 130-135°. Make sure your jars are somewhere they can sit for a while because once you pour the candles, you don’t want to move the jars until they are cooled. Pour the wax evenly into each jar. Now you want to prop the wicks into place while the candles cool so that they stay in the center. I use pencils or clothespins to get the wicks to stay in place. That’s it! It’s fun to check on your candles every once in a while when they’re cooling to see the wax solidify and turn white from the bottom up. Once your candles are cooled, you can trim the wicks to about half an inch. Have a few paper towels on hand to wipe off your thermometer after each time you use it so that wax doesn’t build up on it. Also, wipe out your glass measuring cup right after you pour your candles. 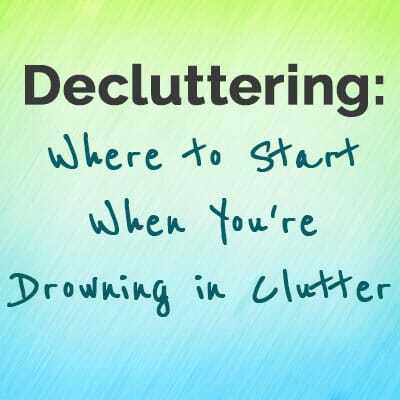 It makes cleanup easier. Let your candles cool overnight and don’t light them for at least 24 hour after you make them just to be sure they are fully set. To give these as a gift, I just cut out a circle of fabric and screw it between the lid and band of the canning jar. You could also make candles in similarly sized mugs or teacups. I’ve been wanting to get some coffee scent to make candles in coffee mugs! 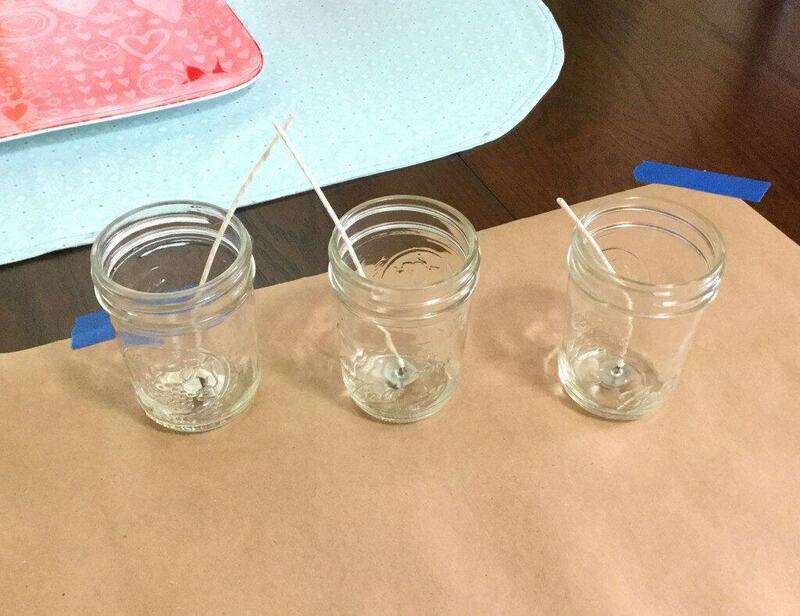 It’s really not hard at all to learn how to make your own soy candles! The last time I bought ingredients, the price turned out to be about $3 per candle, which is an amazing price for a nice-sized soy candle! I love to burn these at our house and have had many people pleased to receive them as a gift. 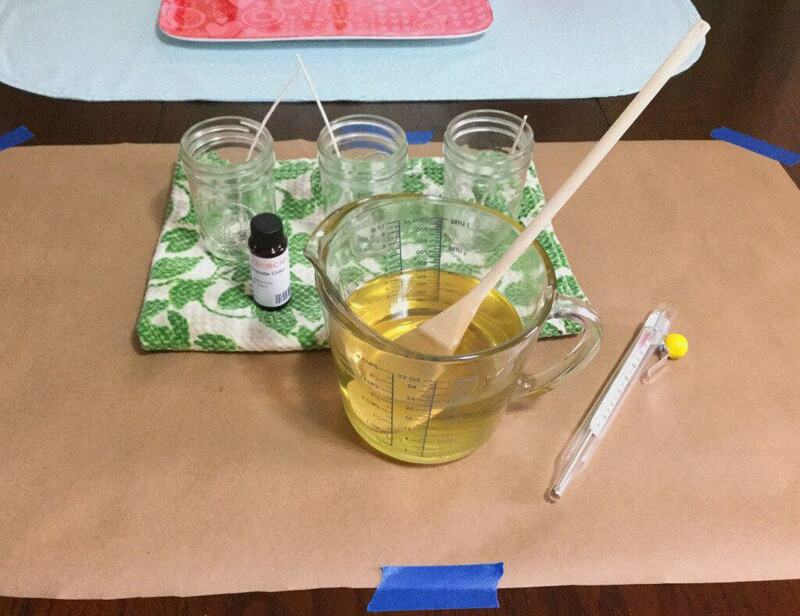 ⇒Have you ever made your own candles? If not, do you think you might give it a try? I haven’t made candles in a long time, time to start again. This looks easy enough, I just hope I don’t mess it up! 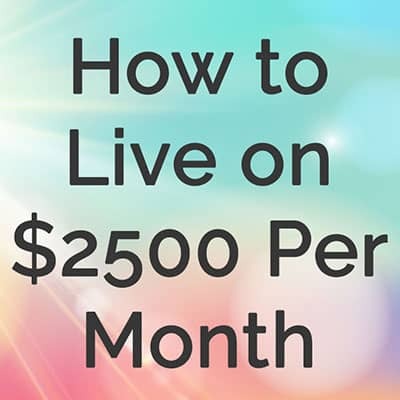 Do you have an estimate as to how much each one ends up costing? It’s really not too hard Marette. From the supplies I bought, each 8oz candle ends up being less than $3, which is pretty good since I found some 4oz soy candles for close to $10! Hmmm, shortening sounds interesting. Very cool! as someone who constantly has a candle burning i loved this. i may just have to give this one a try! Absolutely! I love having candles burning all the time too. So fun! I can’t wait to try this! Good luck Karin! I’m sure it’ll turn out great! You can do it Dia! The first time I was a bit nervous, but it wasn’t a total disaster and it’s gotten better every time! They’re so fun! I really love the fabric tip for gift giving – it really makes them pop! Thanks Lisa! 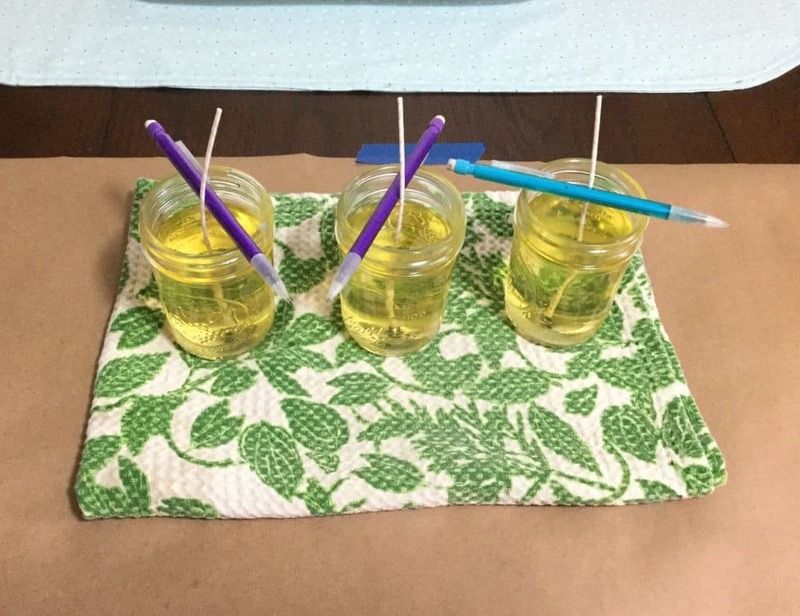 Maybe someday you can have fun making candles with your littles! I remember doing it in school growing up and I thought it was so cool. I really like the theme of your website. Can you please share which one it is?